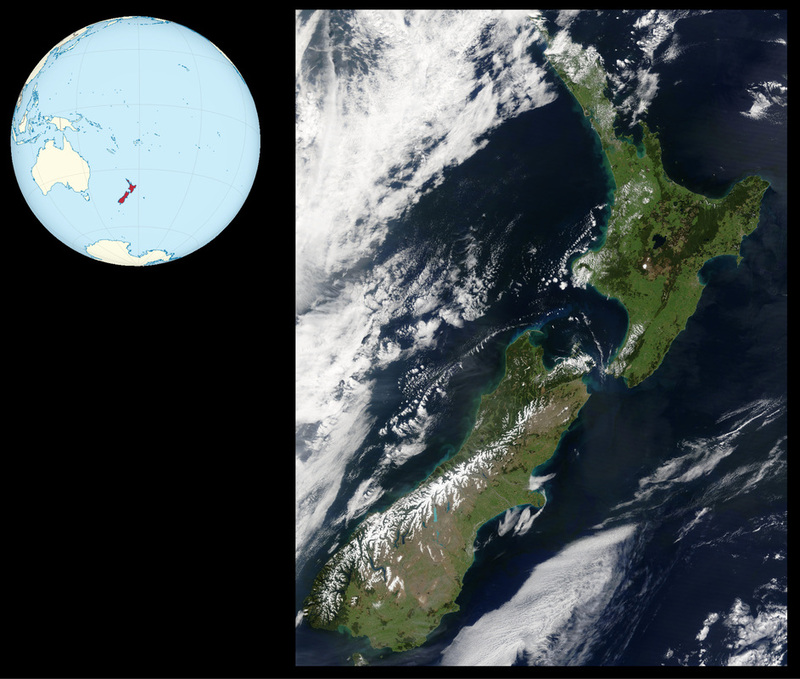 New Zealand is part of a geological plate called Zealandia, that rifted from the Australian plate ca. 85 Mya. Due to its prolonged isolation, New Zealand's biota includes numerous endemic and iconic lineages. Images obtained from Google Maps. During the Oligocene, New Zealand experienced extensive marine incursions, an episode commonly termed the "Oligocene Drowning." An outstanding debate in biogeography concerns whether the drowning was complete (implying that the entire biota of New Zealand postdates the Oligocene and has resulted from colonization by overwater dispersal), or partial (implying that some components of New Zealand's fauna survived the Oligocene Drowning). The litmus test traditionally used for distinguishing dispersal from persistence is the age of an endemic lineage's diversification. However, a prolonged marine incursion event may alter the inferable root age, causing it to be younger than the actual root age. We define the function J as the proportion of a clade's evolutionary history that cannot be observed by molecular dating due to extinction. Sharma & Wheeler (2013) J. Biogeogr. 40: 1609-1618. Due to stochasticity, a single simulated evolutionary process can generate trees with different values of J. Below, the complete simulated phylogenies are shown in red. The corresponding phylogenies retaining extant taxa only are shown in green. 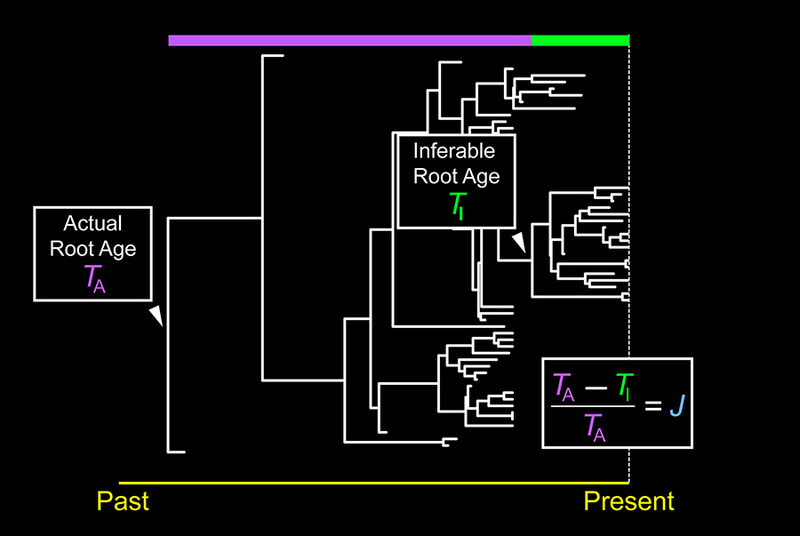 The log lineage through time plots demonstrate different profiles for the surviving lineages, which can lead to different interpretations of evolutionary history in spite of the same underlying process. 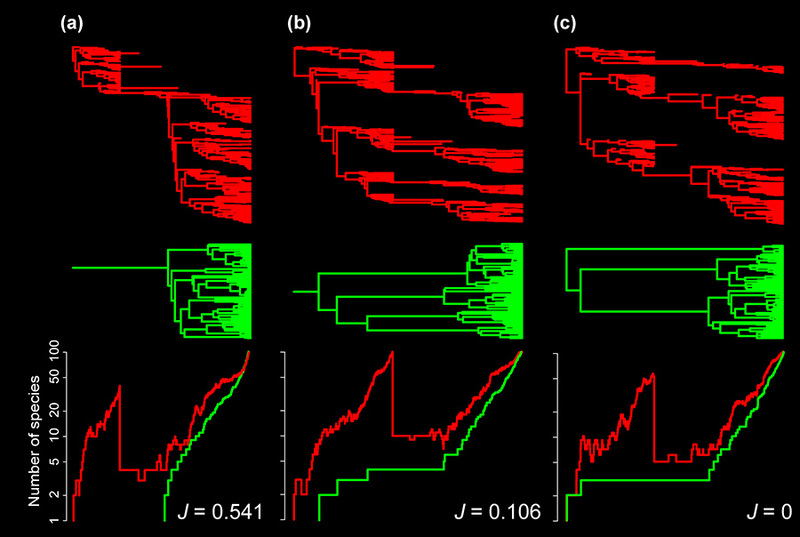 We simulated phylogenies following an underlying model (below) that simulates a New-Zealand-like evolutionary history. 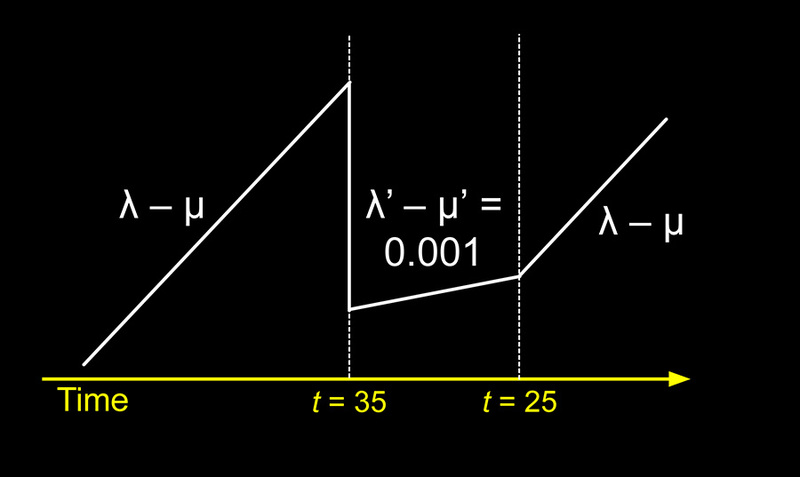 This model incorporates a marked extinction press between times t = 25 and t = 35. Lambda is the parameter for cladogenesis and mu for extinction. We calculated J for phylogenies of different sizes and turnover rates. We found that small clades with high turnover rates are prone to more extensive losses of observable history (large J; bottom left panel in the figure below). 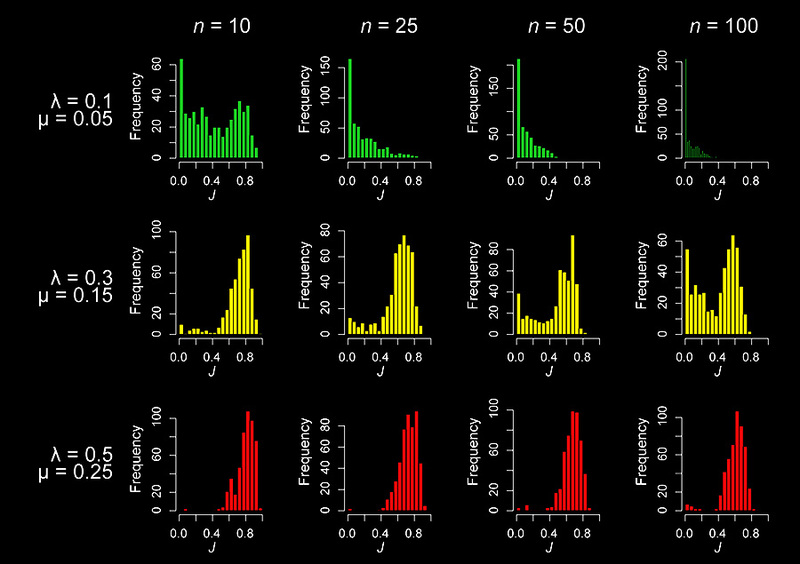 Ideal lineages for biogeographic inference are species rich clades with low turnover rates (small J; top right panel in the figure below). The inferable age of diversification is strongly affected by extinction for small clades, such as island endemics. A review of empirical studies, tabulating diversification ages and species richness of clades both (1) endemic to New Zealand, and (2) having an estimated origin older than the Oligocene, supports the predictions of the simulations. In the figure below, invertebrate lineages are indicated in orange text, vertebrate lineages in white text. Closed circles indicate lineages consistent with the predictions of the modeling; open circles indicate outlier squamate lineages that have radiated in New Zealand, and therefore are more diverse than expected under a model where intrinsic diversity (lambda and mu outside of the extinction press) are constant. Note that small-sized invertebrate lineages tend to have older diversification ages and more diversity than their vertebrate counterparts. 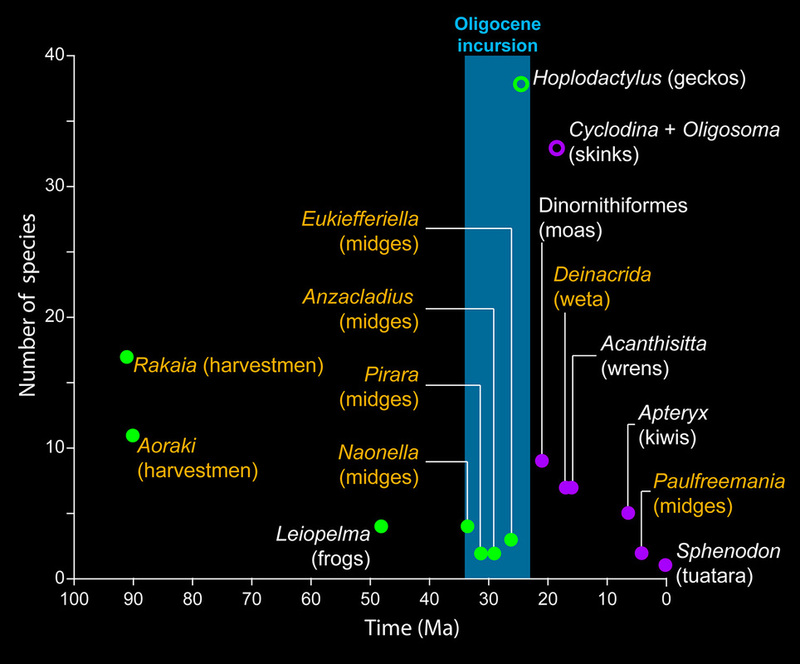 Several of the lineages, both vertebrate and invertebrate, have diversified during or prior to the Oligocene (green circles), falsifying the hypothesis of total submersion of New Zealand in the Oligocene.